NOTES: Stolen from my stash by my son when he was 7. The De Havilland DH.82 Tiger Moth needs no introduction to aero-modellers or aircraft enthusiasts. Ever see the George Peppard movie “The Blue Max” (it differs a bit from the book)? I first saw it as a boy and bought the DVD last year. I still love the aircraft scenes (and a few others). 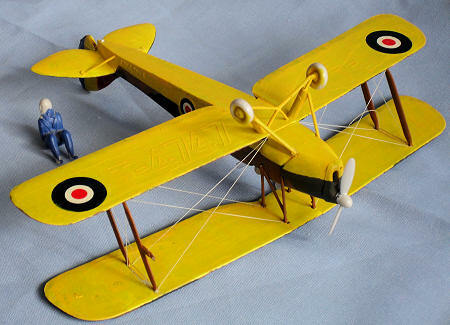 It is obvious to an aircraft enthusiast that some of the aircraft are modified Tiger Moths, so (for fun) I resolved to build a few of them in model-form. Not wanting to spend a fortune on the project, I chose the Smer Tiger Moth as the base kit because of its size, low cost and availability. I bought 3. One afternoon, I took my family and in-laws to the Camden (NSW, Aust) aerodrome to see the entrants of the Around Australia Tiger Moth race, as they flew-in to refuel and have lunch. There were 22 of them in various liveries (did some really wear invasion stripes?). On arrival home, my son went to my stash and asked if he could build one of them. The project modeller in me screamed “NOOOOOooo! !” but I found Dad beaming “Yeeeesssss, my son”. This is a basic kit with almost no cockpit detail and only fair detail. It had less than 30 parts moulded in chunky light-grey plastic. 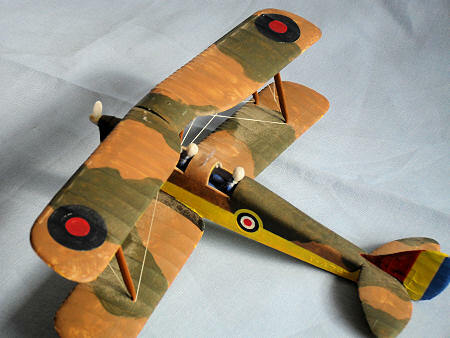 Dunno how it measures-up, because I build models – I don’t measure them, but the finished product looks like a Tiger Moth. Under my supervision, Jason removed all the large parts from the sprues, and (after I washed the parts) started splashing (Sunburst) yellow paint over the under-surfaces and the fuselage. Yellow, because he looked at the colour scheme of the trainer one on the back of the kit box. He also painted the few inside bits with odd colours, and began assembly. In nothing flat, he had the main parts of the airframe assembled. I showed him how to square-up everything, then I showed him how to mask-off the yellow of the lower fuselage. I continued to watch over him as he painted the (Beastial) brown, then the (Catachan) green. Admittedly, I outlined the green areas, and he filled-in the rest. At all times, he was using Citadel Miniatures acrylic paints because they would clean-up with water and they dried quickly. Next day, (when I got out of bed), I found that he had removed the masking and was applying the decals. Here, he was aided by Smer, because the position of each decal was in raised relief, and he was referring to the instructions. Admittedly, I helped the model by tweaking the positions of the decals – just a little. The large ones over the tail fin and rudder were a tad too large, (better than being too small) so I trimmed them for him. At this point, I decided that this was the perfect vehicle to use in an experiment. I had an idea for a method to rig a biplane and decided to try it on this, my son’s model. While he painted the struts and carbanes, I superglued the middle of a strand of EZ-Line into each of the sockets of the lower wing. Jason fitted the struts, then I dry-fitted the upper wing, squaring it up with coins and blocks. Next day, when it was dry, I removed the top wing, drew the EZ-Line over the tops of each adjacent strut or carbane, and secured it with more superglue. This is when I learnt that the EZ-Line need be only lightly tensioned – say 2-3% of its length. OK, I had to attach the top wing to the tops of the struts, then the undercarriage leg assembly underneath. My son attached the unpainted wheels because he was anxious to complete it. Only now did I notice the lack of the two tiny clear windscreen pieces, so I cut some from a piece of thin clear rigid sheet and embedded them into grooves cut across the fuselage spine. Another one finished. As I had surmised, this is a simple kit. 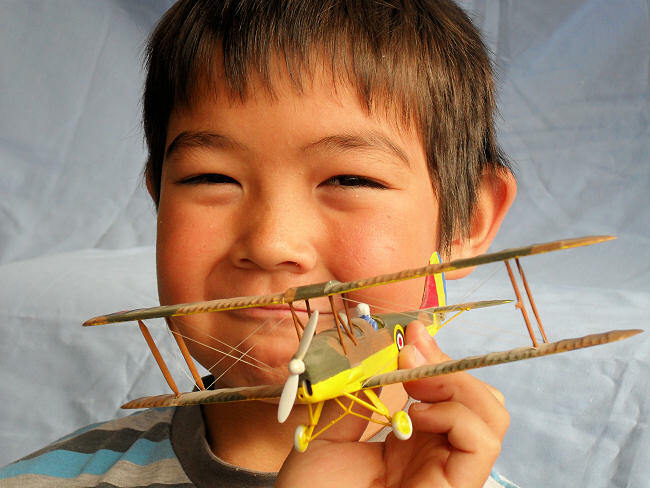 Even a child can make it, and see a Tiger Moth. Dunno if my son learnt anything, but he certainly enjoyed the build. I enjoyed the father/son time and learnt about rigging. EZ-Line is great stuff as it is a fine elastic ribbon that is very forgiving of being bumped or snagged. The other members of our model club certainly thought that he had done an excellent job and they were equally surprised at his ability to discuss Tiger Moths, expound on how-I-built-it-with-Daddy’s-help and about when-I-saw-real-ones-of-these, but then, they are all middle aged (or better) and he and his sister are the only juniors in the club. Just the instructions and the boxart.